Above: We were thankful that some parents (back row) happened to be at Hatvan’s preschool today as they were holding an open house at the same time as our Easter puppet show. 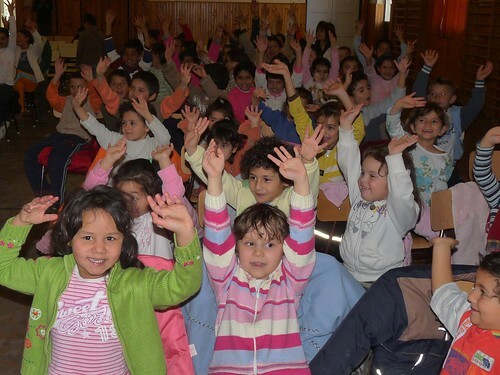 This is a larger town and we had over 100 kids packed in the room. We received a very positive response from the teachers and were invited for hungarian bread and butter sandwiches, coffee and tea after the show. 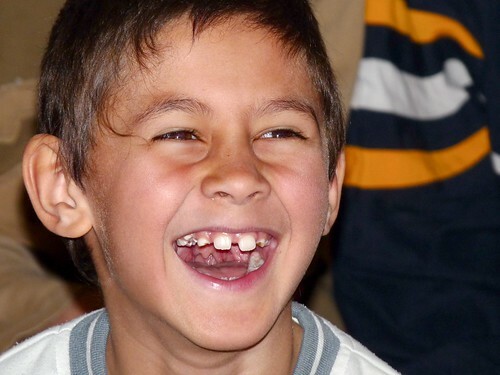 Above: We are always welcomed with smiles and laughter to the Hatvan Special Needs Center. We were thankful for the majority of those attending being able to follow the story and enjoy the show. This is one of the few schools that always leaves our team with a special hand made craft as a gift. We always appreciate their kindness toward us. Above: Our hometown of PetÅ‘fibánya. 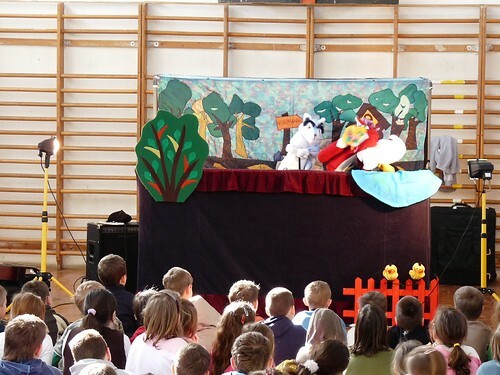 Above: Unlike every other school we bring the Puppet show to, PetÅ‘fibánya requires the kids to bring in a signed permission form to attend our show. We are thankful that this many kids were able to obtain permission, many of whom also attend Miki’s weekly Bible class in school. 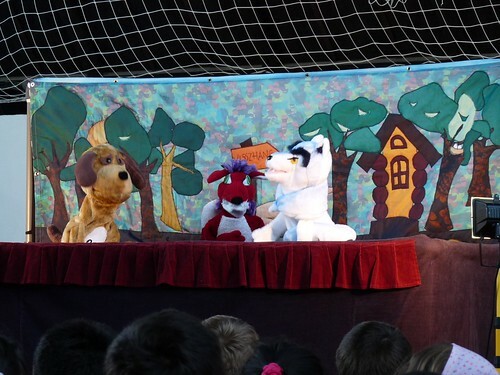 Tomorrow, we hold our final two shows for this year’s Easter Puppet Ministry. We appreciate your continued prayers for us! 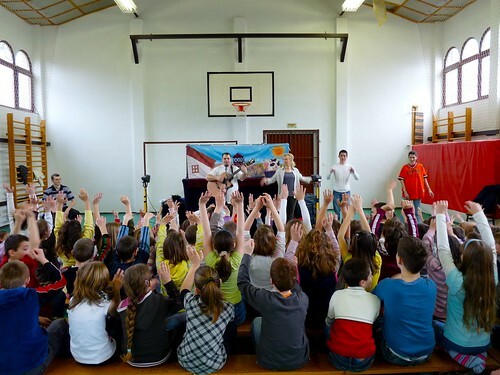 Above: For years, we have been denied entrance into Zagyvaszántó’s public school to perform our Puppet Show. God opened the door this year and we were welcomed with excitement! Above: We thank Him for this successful first show and for the positive feedback from teachers and students. It is our prayer that this door may be kept open as this is a neighboring town that we hope to one day plant a church in. Above: Sharon, Eszti and Hugi. 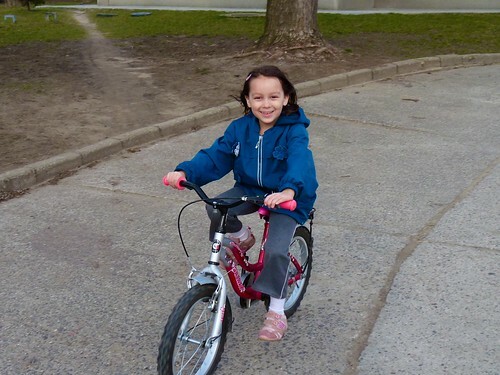 This is our local preschool where both our daughters, Elianna and Kira attend. One of the teachers from this preschool, Edina has been attending our weekly English Bible study for weeks with her husband Feri. Miki also has an opportunity to teach Bible classes to the kids in this preschool once a week. Above: Erika putting up the white color which represents God’s power to cleanse our hearts from all sin. Her use of colors in each school has been an effective way to communicate the truths of the Gospel to the kids in a way they can remember. 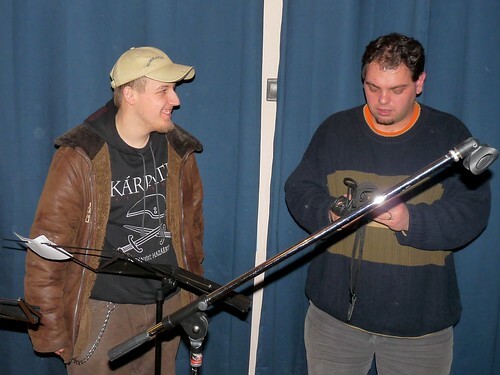 Above: This is where I get to attack Hugi’s puppet, just before Miki rushes in and saves the day. 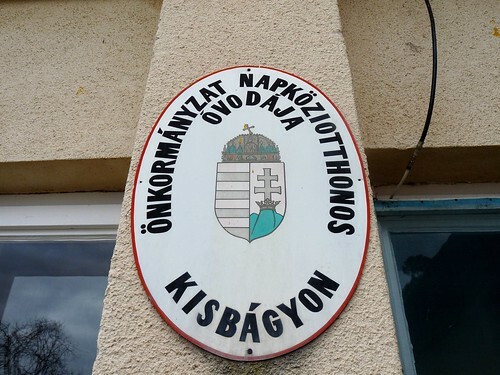 Above: Our second stop for the day was Kisbágyon. As we were setting up and closing the bright orange curtains behind our stage, the entire curtain rod collapsed. Thankfully we were able to do a quick repair before we began our show. We praise God for a great day of ministry. Our team is doing well, but fatigue is setting in. 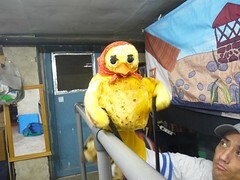 Please pray for a refreshing night of rest and for strength for the remaining few days of our Easter Puppet ministry. 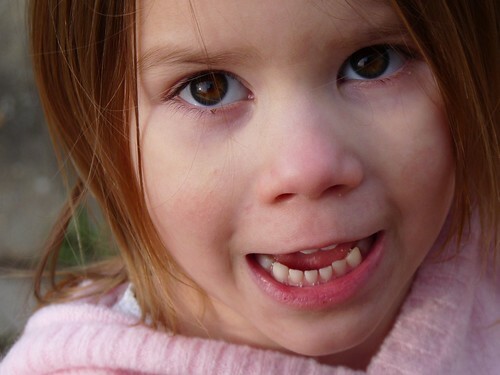 Please also pray for our daughter Kira who has been feverish and coughing. 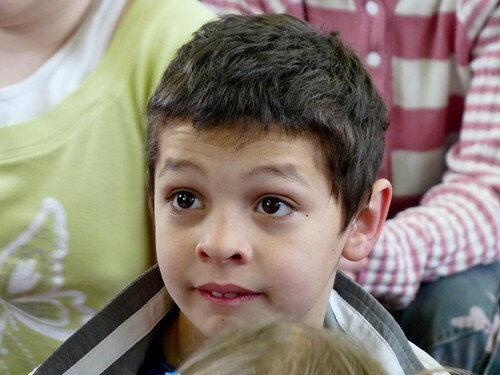 Above: One of the older students from Egyházasdengeleg that has been hearing the true story of Christmas and Easter throughout our puppet ministry over the past few years. 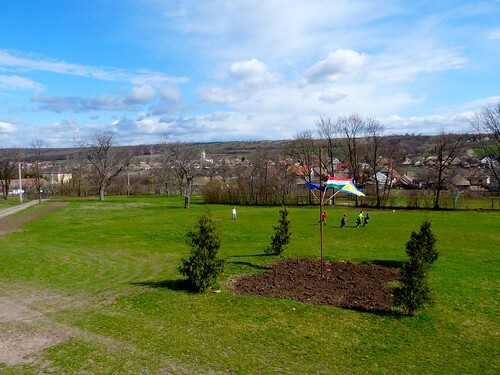 Above: Flags waving in a cool breeze overlooking the village of Egyházasdengeleg. Today we traveled to the small village of Egyházasdengeleg with a population of 500. As we talked to the teachers we learned their plans for their village day celebration which are rooted in paganism. 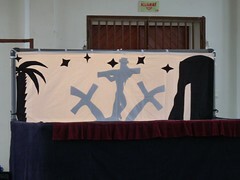 One teacher was carrying a wooden cross not to remember Jesus, but to later build a life sized puppet with the kids. They planned to later march around the village with the puppet attaching papers that they have written their sins, sicknesses, and problems on. Later they would gather together and burn the puppets. Since we have a good relationship with the teachers, having served here every Christmas and Easter over the past five years, before our show Miki was able bring up what they were doing and how it shadows a reality of what Jesus did for us by dying on the cross for our sins. He asked them why they would choose to honor a dead superstition instead of honoring Jesus Christ who is living and the Savior of the world. They answered that it was an important tradition, even if it was superstition that the Hungarian kids should also learn from their ancestors. 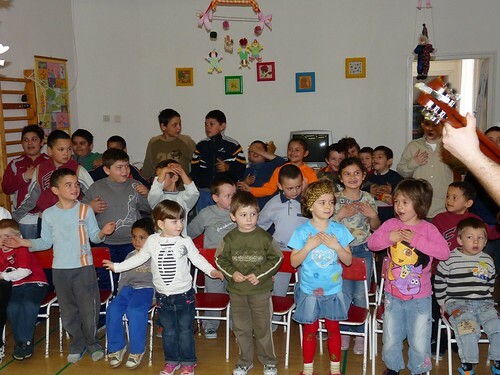 Above: Kids getting their hands warmed up for doing the motions for our songs. The little girl in the front row al the way to the right (black dress) was one who was able to answer correctly when Erika was reviewing the different colors representing different truths of the Gospel. When Erika held up the white color, the little girl said, “He cleans our heart from sin.” The mother directly behind her is a Christian and teaches the Bible to some of the kids in the village throughout the week. Above: Miki giving some of the kids crafted balloons. 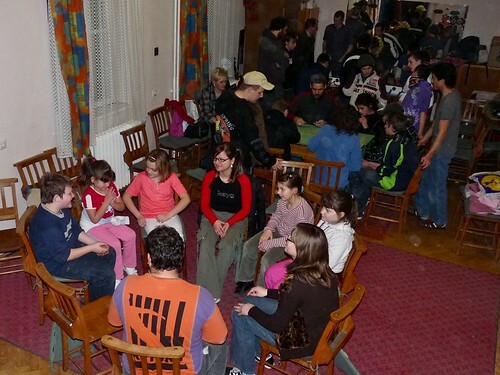 Above: After the show, we were invited to the teachers lounge for tea, snacks and conversation. 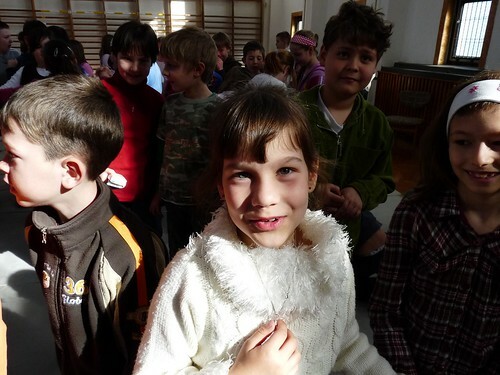 Bori, who has always delved deeper in conversation with us when we visit her school began talking about the terrible situation that Hungary is in, as many struggle to find work in a bad economy. She then began talking about her life, some personal struggles that she was going through and seemed to be asking what life was all about. Was there purpose? God opened up a door for us to begin talking about the good news of finding new life in Jesus Christ and experiencing joy and peace in knowing that we have a restored relationship with God. 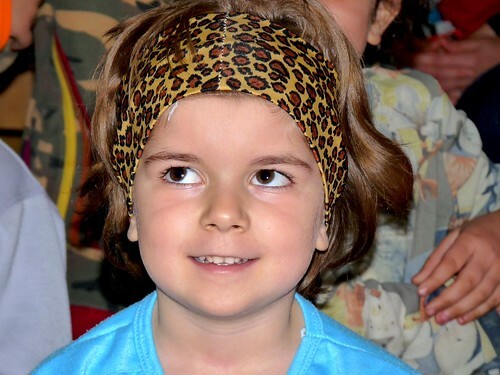 Bori also shared that she just couldn't talk to God in a personal way in prayer. Her view of God is that He is so far above, so exalted that she just can't speak to Him. I told her that this was half true. God is so far above and so exalted, but the other truth is that Jesus in the ultimate act of humility and grace, lowered Himself in order to bring us to the Father and reconcile our relationship with Him. 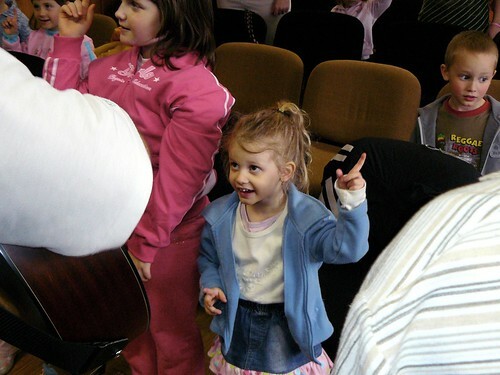 I encouraged her to consider Jesus, who has given us the possibility to become children of God and to call Him "Father". When Jesus taught us to say, "our Father", he certainly did not mean to keep us at a distance from God, but to draw our attention to the new intimate relationship believers have with Him. I told her to find a new view of God by turning her attention to Jesus, what He taught and how He lived in relationship to us. Jesus Himself said, "Whoever has seen me has seen the Father." This conversation went on for over twenty minutes and also shifted to the truth that God has done everything necessary through Christ to obtain for us the means to be forgiven for our sins. Though Bori was asking all the questions, there was also another teacher sitting quietly in the back of the lounge just listening. 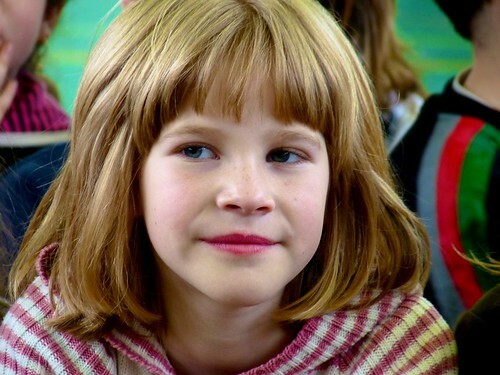 When we had to leave, Bori told Miki to send her more information through her email address, and out of the blue the other teacher who had been sitting quietly pressed a paper toward Miki and said, "Can you also please send me more information also about this… I struggle with understanding how God can forgive my sin. This conversation has meant a lot to me." Praise God for opening up this door to share HIs amazing Gospel and for drawing these two women to Himself. 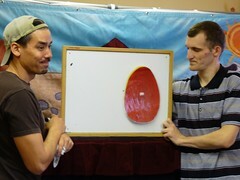 Please pray for these two teachers to come to fully understand all that God has revealed through His Son Jesus Christ. 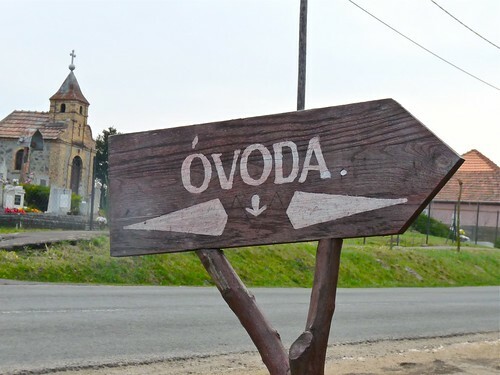 Above: The small town of Szarvasgede is lined with these hand painted wooden signs. 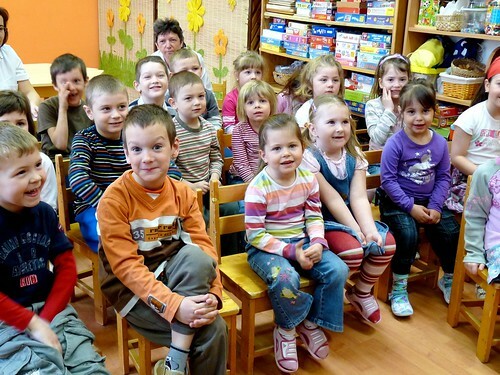 “Óvoda” means preschool. Above: The kids were excited to have us back again. 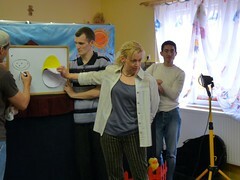 After singing a few songs, Erika used her cut out colored eggs to help the children understand the Gospel. Afterwards, she reviews the colors with the kids and they did a great job reciting what each color represented. 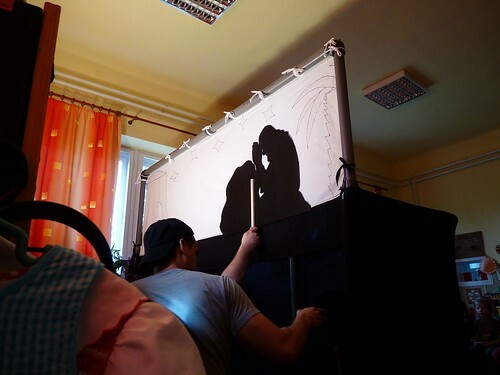 Above: The ending of our shadow sequence where Mary finds the tomb empty, and is told that Jesus is risen! 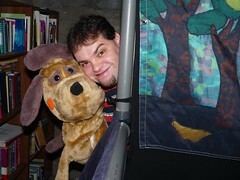 Above: Allen and Miki. It is a privilege to serve with our team who are united in their love for Christ and for one another. 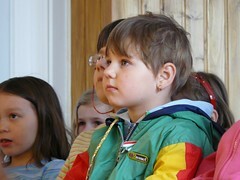 Above: With this amount of kids, sometimes it is hard to keep all of them quiet at various points of the puppet show. This group did a great job, and were especially quiet through the scene presenting Jesus dying on the cross and being raised from the dead. Above: Miki and Erika distributing magazine/cd packets to the kids and teachers. Unfortunately, our show with Rózsaszentmárton on Friday was canceled and we are waiting for them to call back to reschedule. God has been gracious toward us and empowered us to share the true story of Easter with hundreds of kids. Erika’s eye infection is healing and the team overall is doing well. 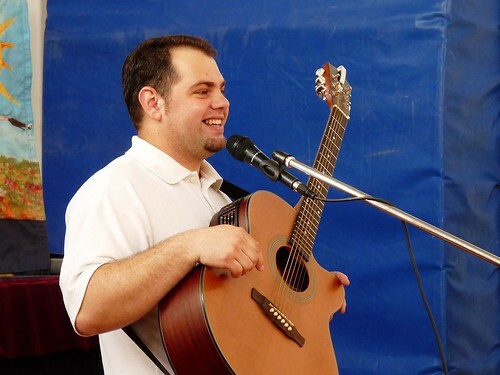 We appreciate your prayers for our next show which will be held tomorrow (Saturday) in the town of Egyházasdengeleg. 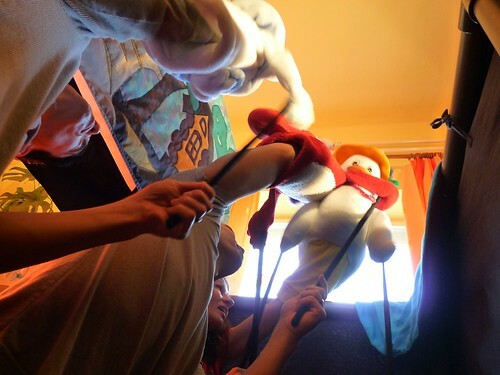 Above: This year’s puppet team, Peti, Miki, Roger, Erika and Hugi. 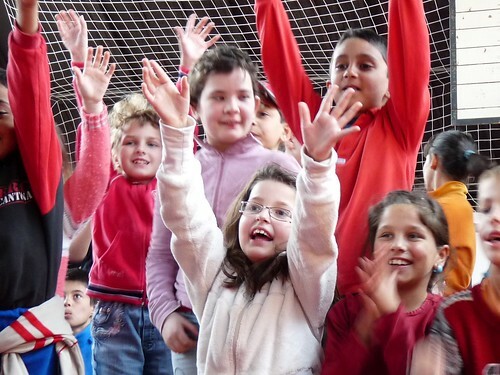 Above: This school continues to be the most enthusiastic singing with us compared to every other school we visit. 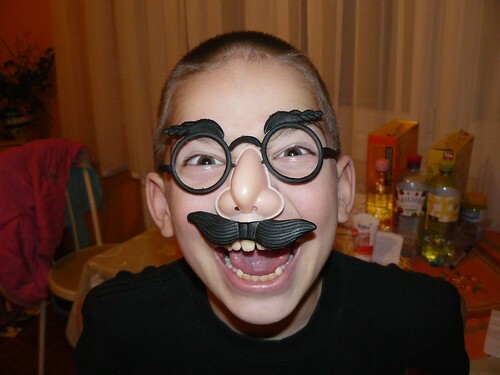 In most schools, the teachers find there way to the back of the room and remove themselves from participating. Here, they were singing and doing all the motions with us. 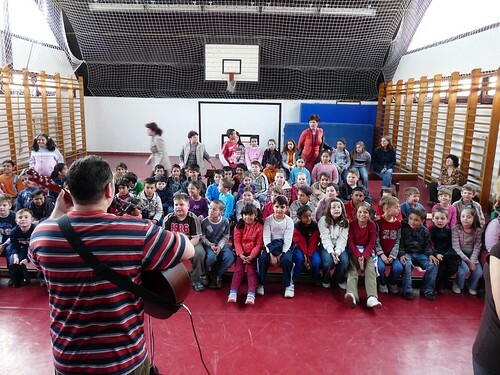 After the show, one of the teachers came back to us while we were packing up and asked for clarification on the third verse of a song we just sang with the kids. She was already singing the song with them in the other room after the show, along with the motions. 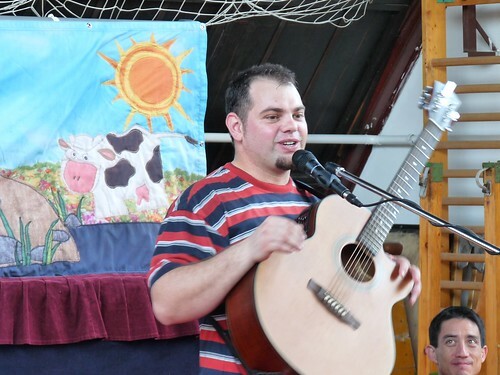 Some of the lyrics include: He died for me on the cross, On the third day He rose, He lives today... What an encouragement to know that after we pack up and leave, the truths of the Gospel continue to be sung in this preschool. Above: A view from the classroom window at our next stop in the town of ErdÅ‘kürt. 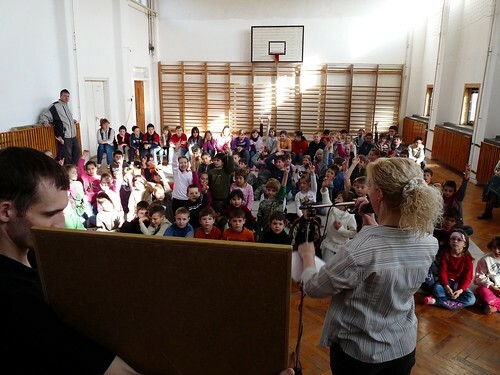 Above: After some quick improvisation with moving desks and chairs, the small classroom filled up with over 80 kids. Above: This child singing along with us pointing to Jesus did a great job answering questions after Erika presented the gospel and reviewed the truths with the kids. 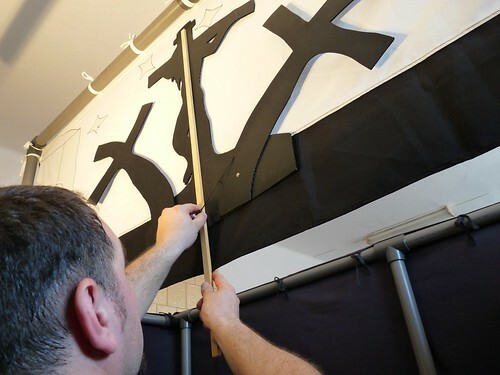 Above: Behind the scenes, Hugi, Roger and Miki raising the cross in our shadow puppet sequence. Towards the end of our show, there was a power outage that knocked out our sound and lights. 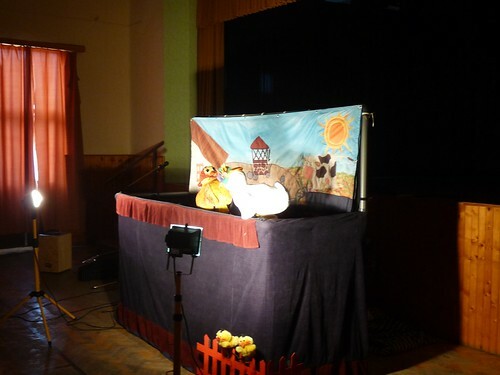 Miki and Roger were performing at the time and slowly lowered their puppets. With these type of power outages, you never know how long they will last. We praise God that the power kicked back on within seconds and the equipment picked right up where we left off. • For healing for Erika’s eye infection. • For Kira who may be coming down with a cold. • For good nights of rest for the team and their families. 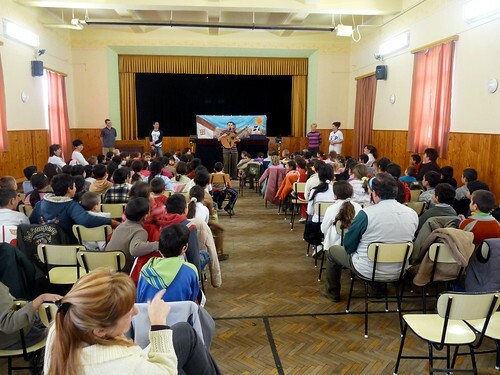 Above: Our first show for Monday was in the neighboring town of Rózsaszentmárton where our son Ben attends school. 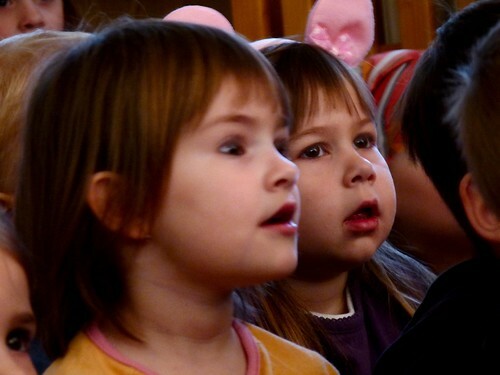 Last Christmas was our first time performing in this town in their elderly home. Previously, we have consistently been turned away by the leaders in this town. 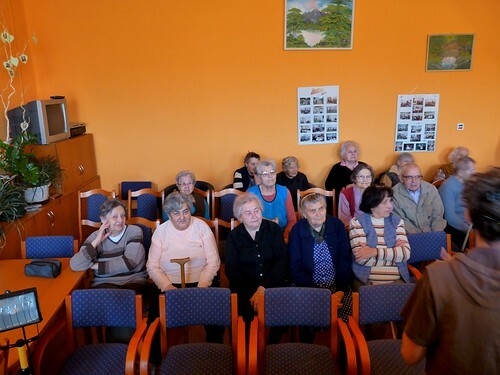 Some of you may recall that after our performance in this Elderly home last year, we were then directly sent to their preschool after one of the Elderly home workers made a phone call. New doors of opportunity seemed to be opening, until we found out a couple of weeks ago that the preschool was not going to invite us back because we were thought to be a cult that was operating in that town. 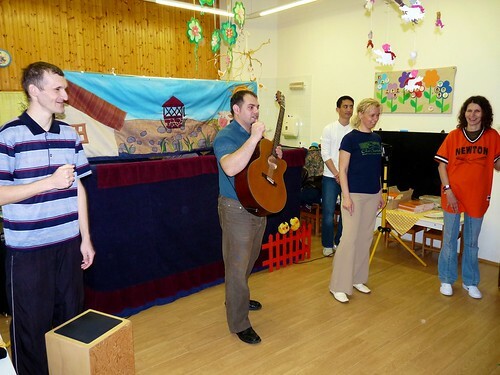 By God’s grace, after our return performance in the Elderly home on Monday, one of the workers informed us that indeed the preschool did want us to return. The misunderstanding of equating us with a cult was cleared up and we will be returning to Rózsaszentmárton’s preschool this Friday! However, the battle is still not over. 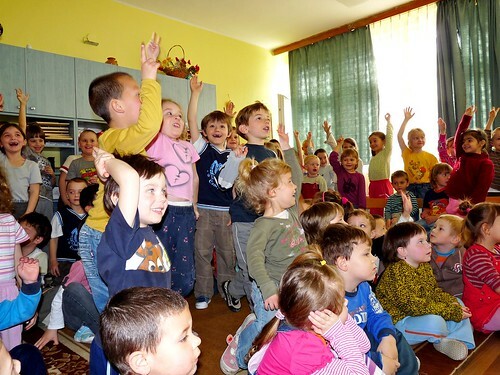 Our teammate Erika sent an email to Rózsaszentmárton’s elementary school (where our son Ben attends) asking if they would consider having us perform this year’s Easter puppet show. Just today, she got a call and was very harshly told to stop pestering them. Erika, being confused as to why one email was considered pestering, tried to find out the source of the problem when the headmaster hung up on her. This may be a case (once again) of mistaken identity and being confused with a cult that is truly pestering others in the town. Please pray that our Father would give us wisdom and also bring peace in our communication with this elementary school. Pray that doors would continue to open (and not be slammed shut) to bring the Gospel to this town. 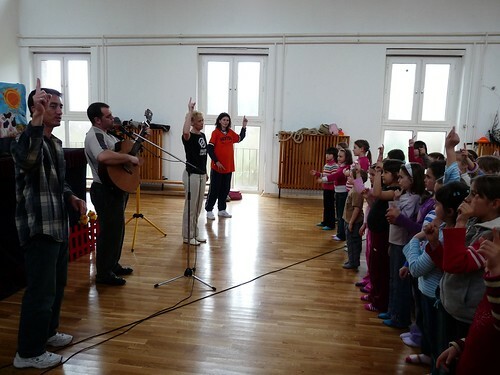 Above: Miki getting the kids warmed up for this year’s song, “Jesus Lives.” We continue to praise God for this open door to proclaim the historical account of Jesus Christ who died and was raised from the dead in public schools. 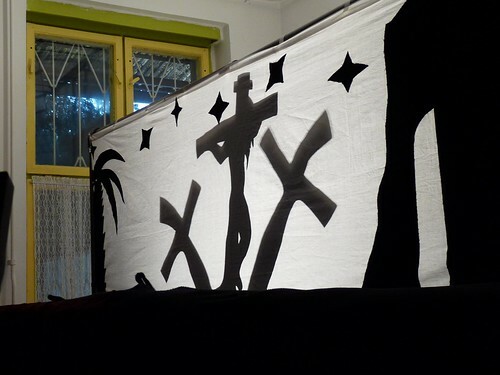 Above: Our shadow puppet sequence is a powerful way to engage the kids as they hear the words of Jesus praying on the cross, and are taught the reason why He willingly died. 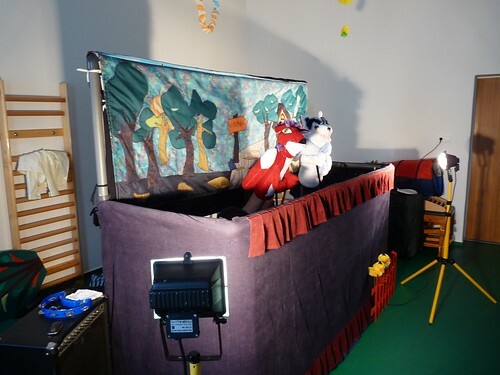 So far there have been no distractions through this dramatic part of our puppet show and each group of kids have payed close attention. 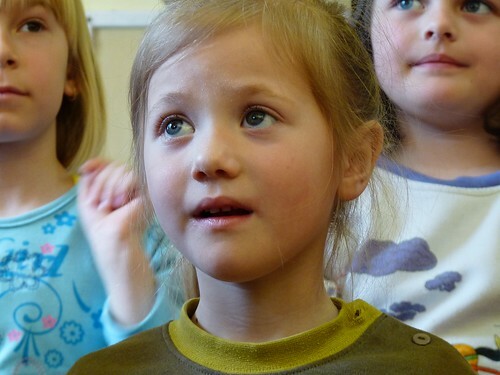 Above: After singing the our new song for the third time, the kids are able to sing along with us and follow the motions. Above: Miki handing off our gift magazine/cd packets to be distributed to the kids. 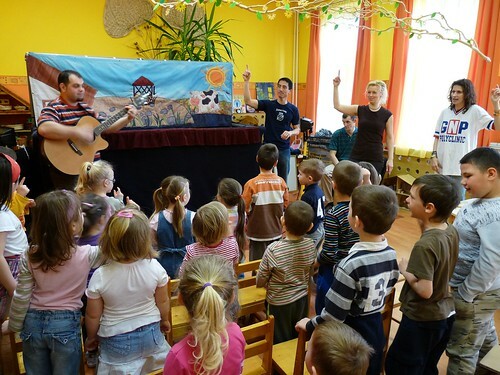 The can listen to the puppet show at home and there are other ways for them to discover more truths about the Gospel in the magazine and CD. 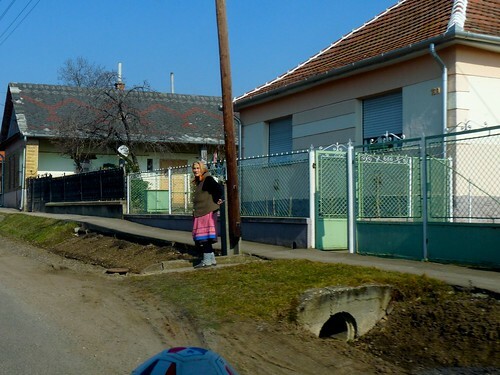 Above: An elderly woman making her way through the village of Nagykökényes. 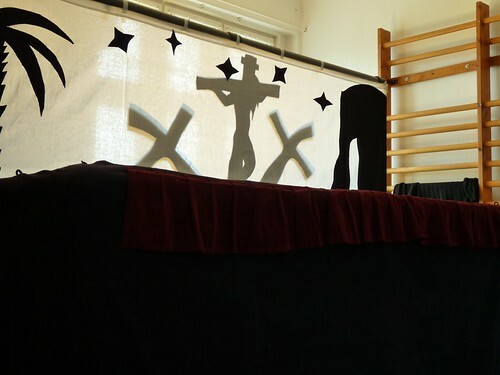 Above: Two of the younger teachers in this preschool were fighting to hold back tears as through the shadow puppet sequence showing the death and resurrection of Jesus. This show is not only for kids, but communicates God’s amazing love through His Son to teachers as well. Above: Smaller village equals a smaller amount of kids... but very cute kids! 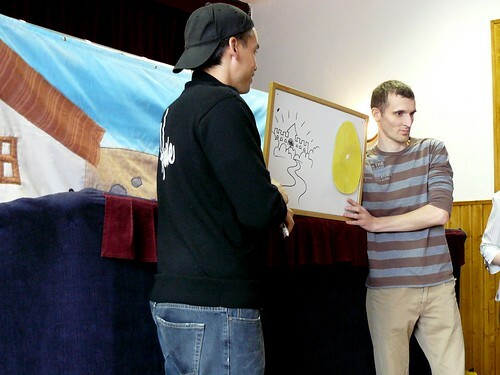 Above: Erika using colored eggs to explain the important truths of the Gospel. Above: After the show, the kids couldn’t wait to dig into the gift magazines. Above: A good sign! 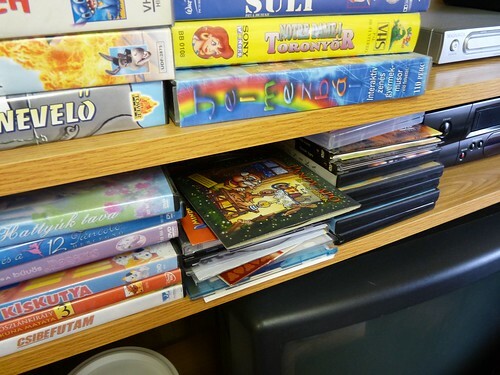 Among the various videos for the kids, last year’s Christmas puppet CD that we distributed is sitting right on top. Most likely the teachers play it for the kids at various times in preschool. Above: Benjamin, Elianna and Kira had beautiful weather to enjoy over the weekend and were excited to get back to bike riding (just learning last year). 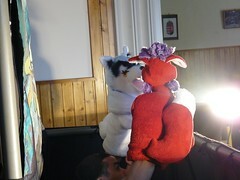 Thank You all for your continued prayer for our Easter Puppet Ministry. • The show (even though full of difficult transitions) has been going very well. • All equipment is working well. • Our team (except Erika) is healthy and sleeping well. 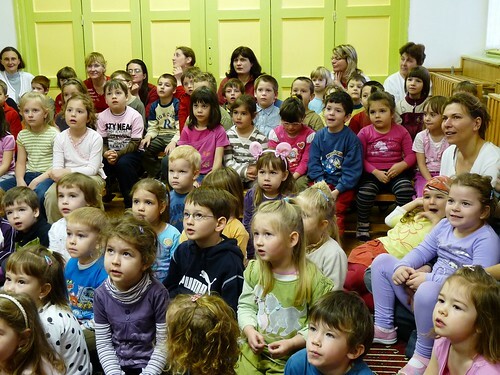 • We were invited back to Rozsaszentmárton’s preschool. • The truth of the death and resurrection of Jesus Christ is being proclaimed. 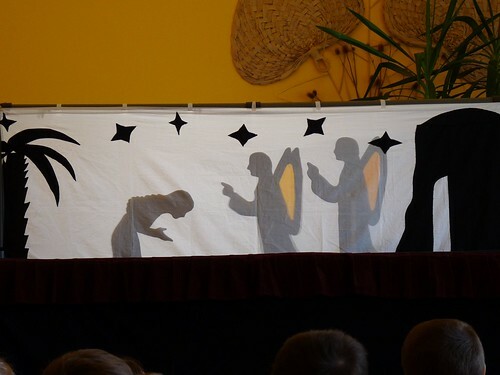 • School’s are receiving us with kindness and children are engaged especially in the Easter story shadow puppet sequence. 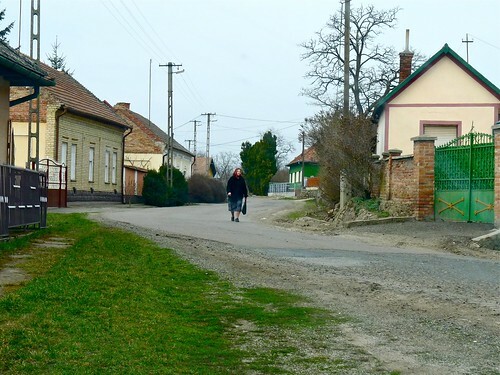 • For years, the neighboring town of Zagyvaszántó has not allowed us in their elementary school. God has answered prayer and we are allowed to perform this year! 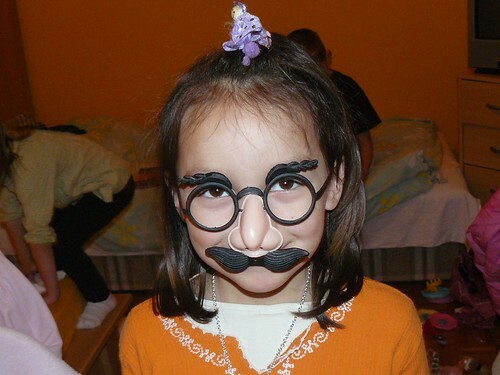 • Erika is suffering with an eye infection. Please pray for healing. 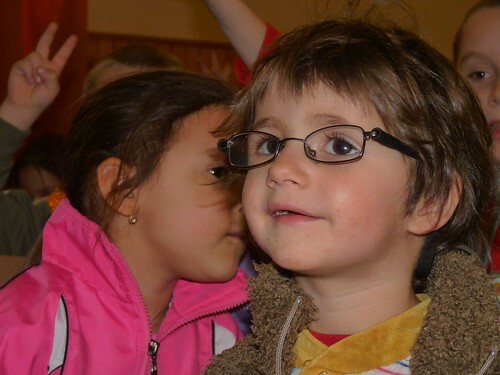 • The call from Rozsaszentmárton’s elementary school shook us up. Please pray for wisdom as to how to proceed. • Team member Peti is able to serve with us because he is still unemployed. We are thankful for his tremendous help, but we ask that you pray that God would provide work for him. 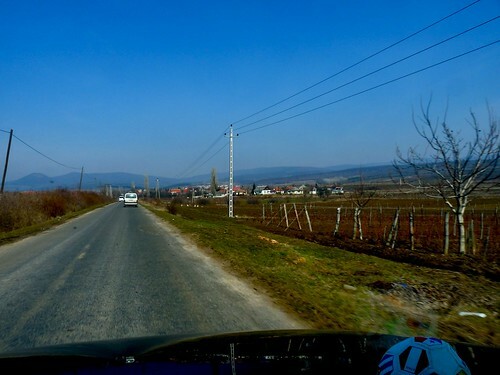 Above: After piling multi colored suitcases filled with our stage, puppets and audio equipment we set off on the back winding roads to the small town of Gyöngyösoroszi. Last week, these fields were coated with snow, but we rejoiced in the beautiful sunshine and warmer weather that God has provided. Above: Miki getting our show started with a few ice-breaker games involving the audience. 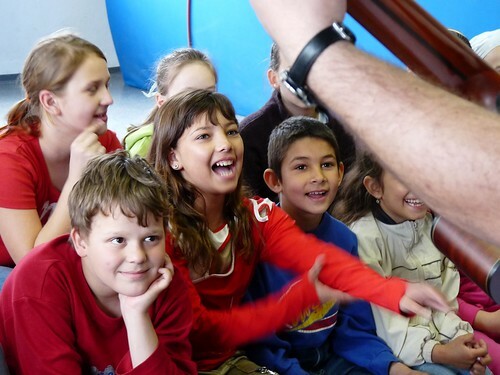 Above: Though the younger kids are always a bit hesitant at the beginning of our show, after a few games and singing they are all smiles. Above: This is one of the more technically difficult shows that the ones we have done in the past. There are multiple rearranging of the set and lots of shuffling happing behind the scenes to keep up with the timing of the audio for the show. Even with the many parts of the show that could go wrong, by God’s grace, they all went right. 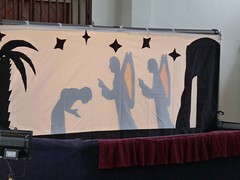 The kids were very attentive and most importantly payed close attention to the shadow puppet sequence which communicates the death and resurrection of Jesus Christ. Above: Teammate Hugi offering some help with a jacket before the kids returned back to classes in school. Because of a sickness years ago, Hugi lost full mobility of her right hand and often communicates how God used this struggle in her life to draw her to Himself and to put her trust in Jesus. 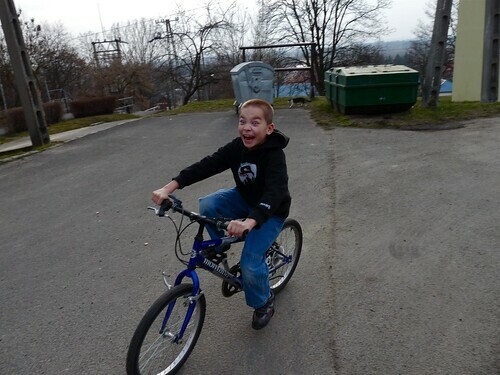 Even with this disability, Hugi serves with great joy and is a special addition to our puppet team. Above: Ben, Elianna and Kira clearly related to one another. These photos were taken at a conference the kids attended with Sharon that equips parents with various educational tools and training for kids that live oversees. We were thankful to have Klári bring her two daughters to our Bible study. One of them is a teen (also named Klári) and the other (Réka) is right between the ages of Elianna and Kira. 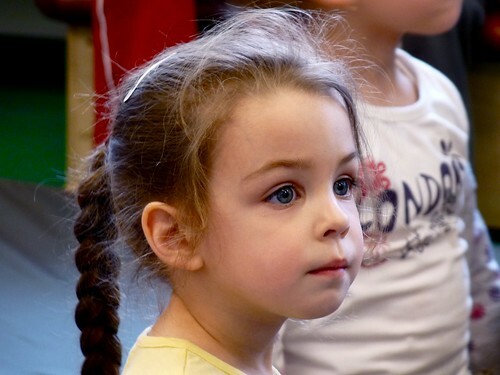 Our kids had a great time playing with Réka and I think the younger Klári has fun being with her mom in our English study. 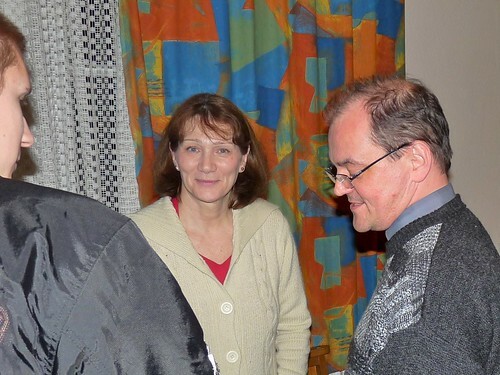 Edina (Kira’s preschool teacher) and her husband Feri also attended. We finished chapter 6 of the book of John where Jesus claims that He is the bread of life and discussed Jesus’ teaching that only He had the words that lead to eternal life. There was a good amount of interaction and after the study, Edina brought up a question about the differences in our faith and another prominent cult that is in our area. Apparently a person is coming to her and telling her things that she feels are not true, but doesn’t know how to defend herself. I told Edina that she could best prepare herself by comparing the Jesus that the cult talks about with the Jesus of the Bible. In essence, I encouraged her to study what Jesus taught about Himself in Scripture rather than listening to theories and opinions of others. It is disheartening to know that the enemy is using a partial truths and the name of Jesus to deceive many, but it is very encouraging that Edina is coming here each week and hearing Jesus’ teaching about Himself. Before going home, we were able to give Edina a Bible and we ask you to pray for Feri and Edina to feed on the bread that will bless them with eternal life. Above: The number of kids keeps increasing from week to week. 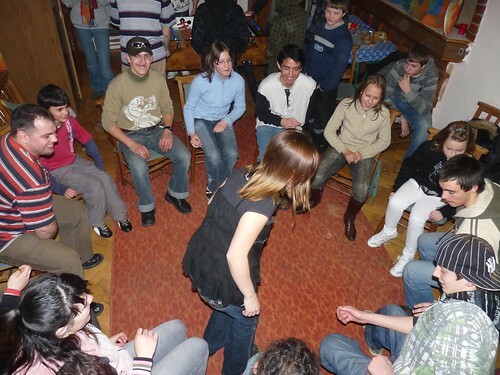 Some stay for just the games, but more and more are staying for our singing and discussion time that we use to talk about truths of the Gospel and personal testimony. 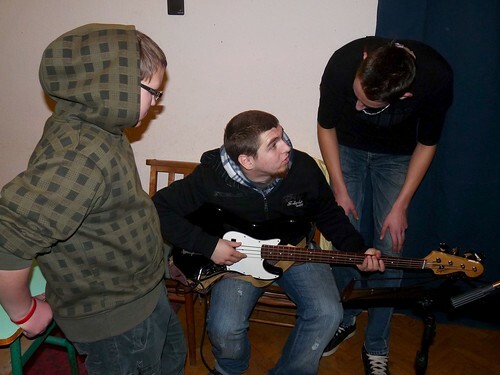 Above: Erik strumming on DezsÅ‘’s bass guitar while some other friends look on. Interestingly, the three kids above are from three different towns that we are targeting long term, Rozsaszentmarton, LÅ‘rinci and our hometown of PetÅ‘fibánya. Above: Those who stayed after to hear DezsÅ‘’s testimony and Gospel presentation were more in number than we have at a typical worship service on Sunday. God is opening up a door with these teens and we praise Him for this opportunity! 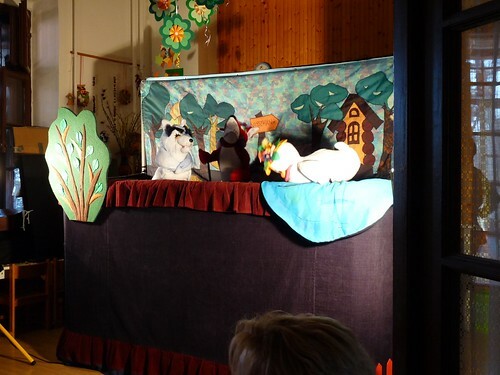 Our next Puppet show will be on Monday. 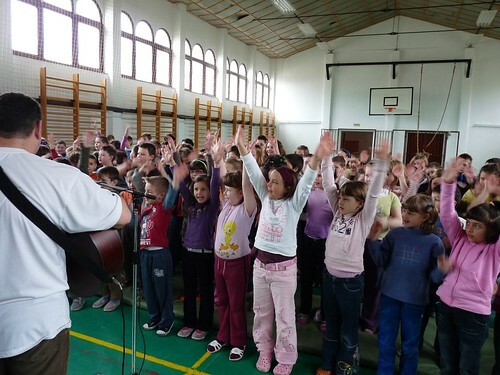 We appreciate your prayers for our team and for the next generation of Hungarians to turn to Jesus Christ in faith. 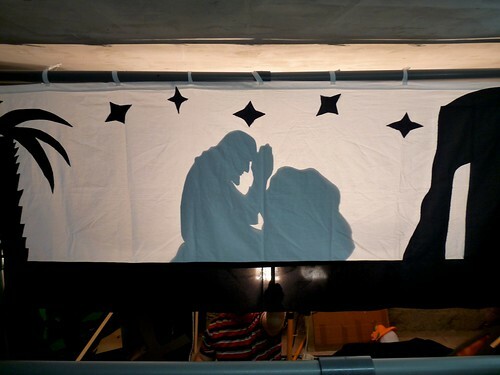 Above: This year’s shadow puppet scene showing Christ’s praying in the garden that the Lord’s will be done. Later, His death and resurrection are depicted. This is a very powerful tool to share the true meaning of Easter to over a thousand kids this year. God has already helped our team to learn the show and we have over 20 schools lined up that we will travel to starting on Friday next week! We do have a financial need once again as we hope to distribute gift packets to each of the children we meet. I should have a more exact amount needed soon, but we estimate that we need around $400 to cover the cost for the magazine/CD packets that contain the gospel for the kids to take home and listen to. If you would like to donate toward these packets, please contact us via email. UPDATE: This need has just been met. Praise God! Above L to R: Hugi, Erika, Niki, Marika and Gabi (Niki’s brother). This is such an exciting spiritual season for us in PetÅ‘fibánya as God is raising up those that are maturing in their faith! We believe we are called to “equip the saints for the work of ministry, that is, to build up the body of Christ, until we all attain to the unity of the faith and of the knowledge of the Son of God - a mature person, attaining to the measure of Christ's full stature.” (Eph 4:11-13) Equipping does not happen overnight and this small group is one step in many to help these growing members capture a vision for God’s mission and to know their unique role and privilege to take part in that mission. It is so encouraging to have such a wide range of ages in this group and to see how God is teaching them as they follow Jesus. 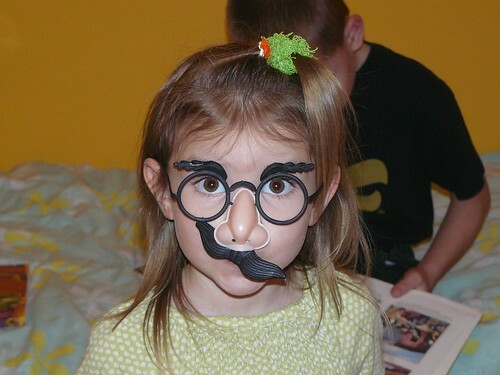 Niki, who is our youngest church member shared with us how she is ridiculed at school for openly being a Christian. Niki chose to break off a relationship with a boy who was not a Christian solely because of what she came to understand in God’s Word. Because of that decision the word spread and she is often asked the question, “Why?” Why so serious about God? Why break off that relationship? 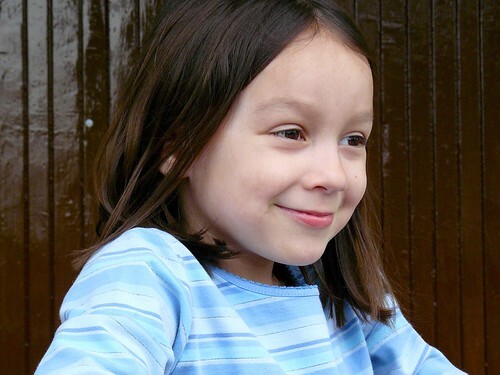 Niki has opportunities also to discuss her beliefs online as students chat back and forth everyday on the internet. Obviously, this is not easy for her and she has a lot of room for growth... but she is growing by God’s grace in an environment that is very oppressive and opposed to committing her way to the Lord. Please pray for Niki in these difficult situations to stand firm in her faith and to know the Father’s love in those times that will sustain her and lead her. Above L to R: Erika, Edina, Feri, Zach and Gyula. 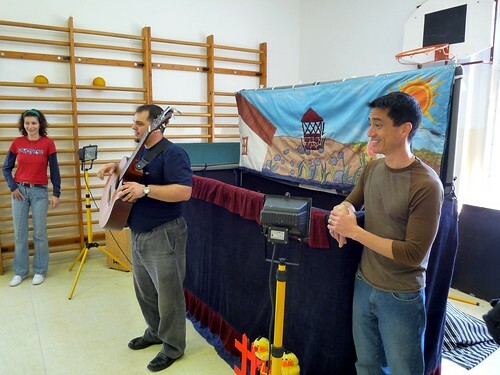 Zach, who attends our home church in the US came out to visit as he surveys Hungary, builds relationships and seeks God’s guidance in his plans to serve in Hungary full time in the future. 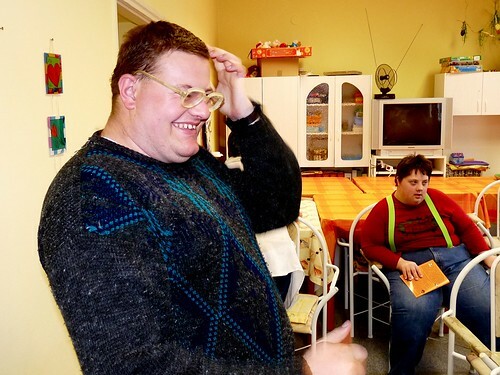 We were thankful that he could get a taste of the various ministries in PetÅ‘fibánya and have a full dose of Hungarian language in the time he spent with us. Above: Kati and DezsÅ‘. 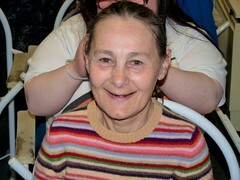 Kati who is the mother of teenager Norbi enjoys dropping into our teen ministry when she has a chance. 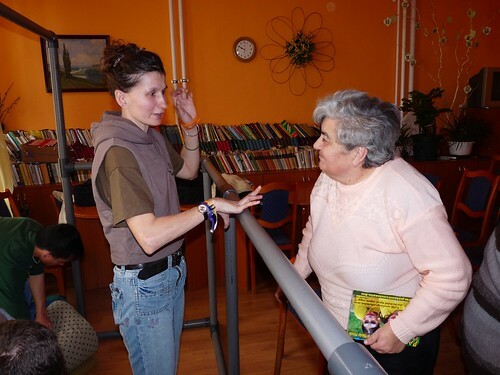 In this environment, she can approach us and discuss various questions about life and God. Her son Norbi is tagging along with us on our puppet team and they are both open to spiritual things. Please pray for them both to find life in Jesus Christ. Above: More packed every week. 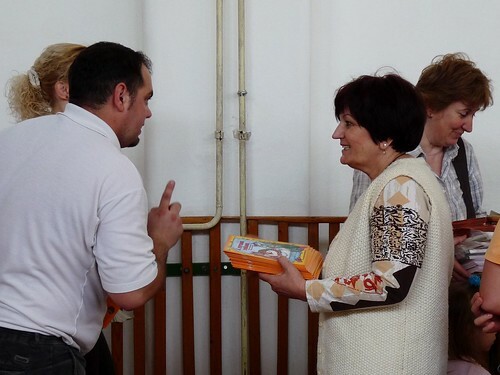 Above: Eszti explaining some of the basics of the Bible to two of the teens after they received one as a gift. Above: Roger, Ádám and Eszti. Ádám and Eszti first came to know us through our VBS and continue to hear testimony about Jesus and the gospel at ministries like these. 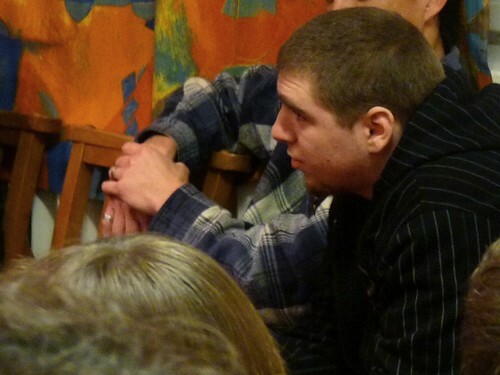 Above: Teenager Erik visited for the first time on Friday and was very intrigued by our discussion led by DezsÅ‘. Erik also showed interest in attending our English camp that we are already planning for this summer. 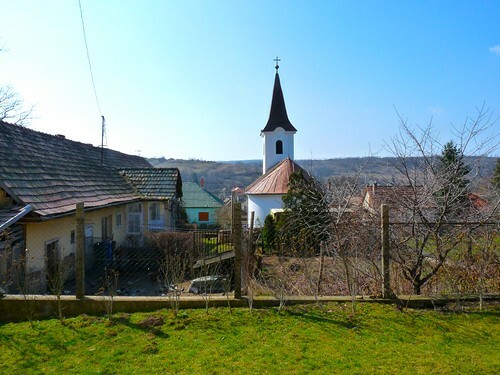 Erik is from the neighboring village of Rozsaszentmárton that we also hope to reach with the Gospel. Above: Regi, Marcsi and Heidi. Above: Teenager Ricsi and Miki. 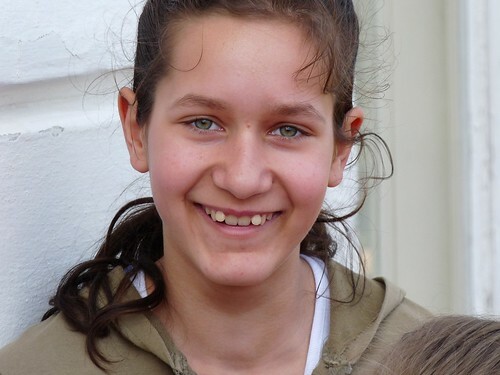 Six years ago, Ricsi was one of the children that attended a Bible class that Miki and Erika held in our village. As a teen, he drifted away and like many of the other kids who attended, we lost contact with them. But just like Gabi and Niki who were brought back years later, Ricsi stepped back into our Friday night outreach and now is attending our church on Sundays. 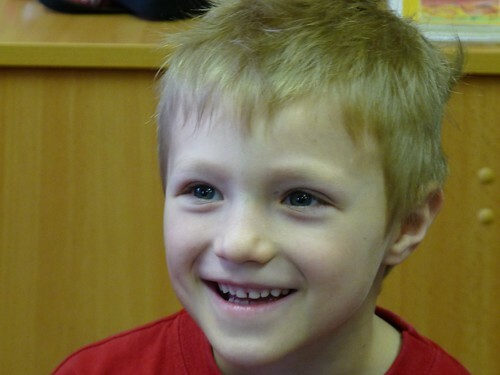 Ricsi loves music and was able to have a conversation about one of His favorite bands with DezsÅ‘. DezsÅ‘ graciously yet with great conviction was able to point out why he personally didn’t like the band Ricsi asked about. 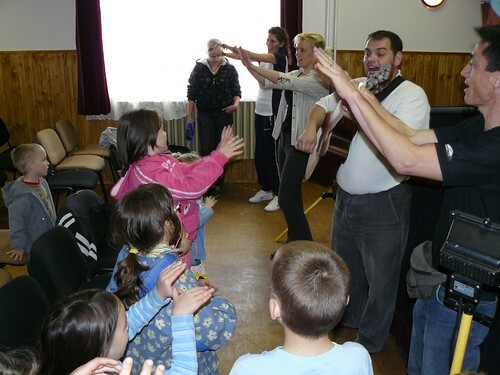 Being familiar with the lyrics, DezsÅ‘ was able to bring up examples of racism that the band promoted and explained why we view all people as created in the image of God. This (our church and our Friday outreach) is most likely the only place that Ricsi is hearing God’s truth on how we are to understand humankind and our relationships with one another. 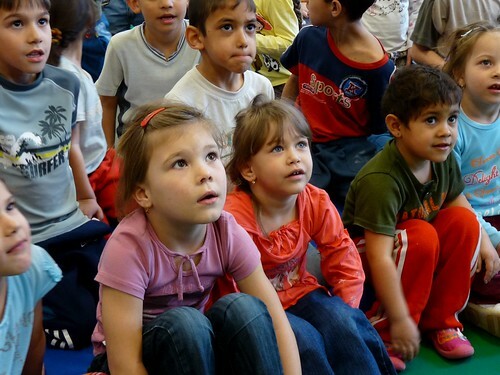 There is a prevailing acceptance in the culture of discrimination against Jews and the Roma in Hungary. There is even a political party that has gained a high degree of popularity that promotes these views and has an opportunity to be elected into power in April. 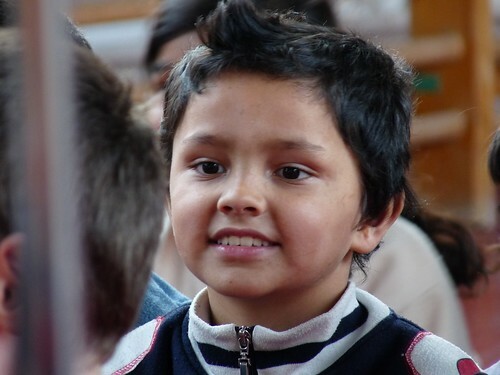 Please pray that the Gospel, and the teaching of Jesus Christ, the Son of God would transform the minds and hearts of the people in Hungary, starting with Ricsi.